Homeowners may have many questions about the materials used for deck waterproofing. Terminology the average lay person is unfamiliar with is often used that can leave a person puzzled as to what is really going on. They may have their own ideas that are important to them of how the project should be approached but lack the knowledge to ask the right questions. It is important to build a relationship of trust by being able to effectively explain what all of this “stuff” is as well as its purpose. 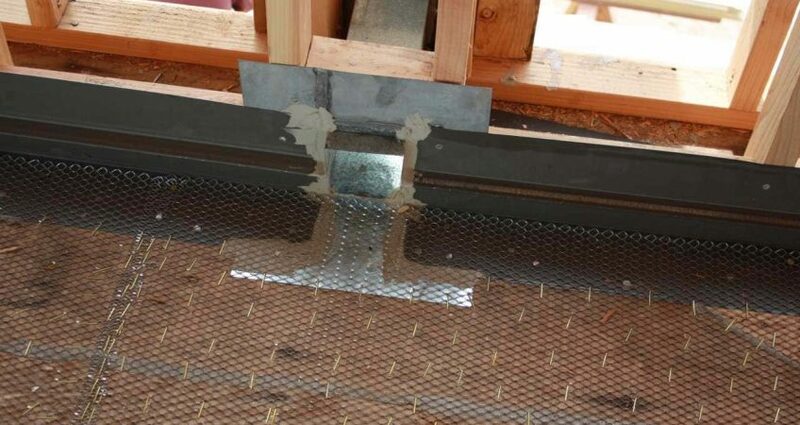 Flashings are metal strips that are installed in plywood decks to cover the seams where two sheets of plywood meet. A flashing will also be installed around a drain. On roofs, flashing is often used to protect junctions between the roof and chimneys, ventilation shafts or where a part of the roof transitions to an overhanging porch. These metal strips help to prevent water from penetrating into these seams and junctions. To make a flashing impervious to water, its edges are caulked to create a waterproof seal and bond with the surface material. Caulk can be comprised of different formulas. The type used depends on the surface material, whether a project is indoors or outdoors, and personal preference. The choice typically comes down to latex or silicone. However, there are now available caulk products that combine the two formulas. Some professional craftsmen have their own personal preference between latex or silicone. Many opt for the combination product so they can enjoy the benefits of both. This mouthful can best be described as a steel base product used to reinforce a surface. It can be combined with other products, such as water resistant paper and wire, to create a framework for surface materials to adhere to. It is often used in the process of creating a stucco finish. Before applying any sealant products it is important to begin with a clean, dry surface to maximize adhesion. The most commonly deployed tool for this job is a power washer and cleansers designed specifically for the wood surfaces of decking materials. However, many of today’s consumers are concerned about the “green” aspect of this approach. Do power washers waste or conserve water? Is the pressure powerful enough to damage wood fibers? Are specialty cleaners non-toxic? Are they environmentally friendly? Will it produce fumes that pose a health hazard? Water Conservation: There are options to tapping into a traditional municipal water supply. If a homeowner is an avid water conservationist they may have a rainwater collection system. Many power washers have water reservoir tanks that can be filled from such a source to use in cleaning the deck. Or, a homeowner can always opt for the old-fashioned scrub brush approach. This, however, is much more time-consuming and may prove less cost-effective. Wood Fiber Damage: An inexperienced user of a power washer system could very well cause damage. If the pressure is regulated too high, an inappropriate nozzle is used or the tip of the spray wand is held too close to the surface of the wood some of the wood fibers can become dislodged or damaged. This will result in the surface of the wood having a fuzzy appearance. If you don’t have confidence in doing the job right, then it is back to the old scrub brush method. Cleaners: The good news is that there are non-toxic, “green” cleaners available to use on decking materials. The most popular deck cleaners are a bleach product. Two types of bleach are available, chlorine bleach or oxygen bleach. Despite the bleach connection they are very different cleansers. One is non-toxic and green while the other is not. The non-green option features the same type of bleach seen in a laundry room. Laundry grade bleach is a chlorine bleach. The most common bleach based deck cleaners contain chlorine bleach. For an environmentally friendly deck cleanser, opt for an oxygen bleach. Read labels carefully. If you see sodium hypochlorite, that is chlorine bleach. Oxygen bleach is most commonly sold in a powder form. Non-Toxic Clean: This powerful cleanser is comprised of soda ash and hydrogen peroxide. When mixed with water to create a cleaning solution, you have, basically, water, oxygen and soda ash. Oxygen ions soak deeply into the wood. Bubbling action breaks apart particles of algae, dirt and mildew. They will bubble to the surface to be easily rinsed off. This green cleaner is environmentally non-toxic and fume free. The various details of a deck waterproofing project can sometimes be overwhelming. It may seem to have a language of its own. To stay informed on techniques, methods and products used in deck waterproofing systems, please contact us. The qualified professionals on our team are happy to answer your questions.